Thousands of customers have come to know Brent as a straight shooter; honest, caring and truly experienced to handle their garage storage needs. So take your time looking at our website. If you have a question, just pick up the phone. If you just want to talk, Brent is a great listener! If he is helping other customers, please leave a message and he will get right back with you. We look forward to working with you to " Take Back Your Garage!" " From time to time you may find "like" products for less. While these offers come and go we are still here installing the SAME quality products since 2003. Remember lifetime warranties are only good if they are still in business. We understand and encourage you to shop. All we ask is you to compare us on product, service and price. This is not our part time job. 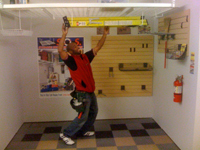 Garage Storage and helping customers put a smile on their face is our passion! We do not use third party installers and we only use the top products on the market. We guarantee you will be satisfied because that is what we do." 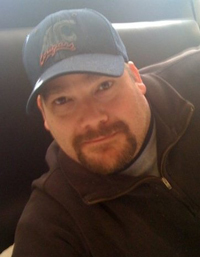 Damon - Garage Guru - Damon has literally been in thousands of garages helping customer with their garage storage needs. He has been in this industry for over five years and installed many of the overhead brands on the market today. If you want to know the why our SOS units are superior to the competin brands ask Damon. Anyone who has worked with Damon knows you get nothing short of 110% when it comes to creating storage solutions in the garage. We at Ideal Garage Solutions refer to Damon as the Garage Guru! "First and foremost I love what I do. Every day I get to meet new people and work with them to get organized. I believe in the products we offer and it is my goal to educate them on all the possibilities. I worked for years as a carpenter so I understand the structure of the house. This is critical when installing units that will support hundreds of pounds that cars and people will be walking under. I would not install these units unless I knew they were the best on the market. I do admit I get frustrated seeing new companies try to come in and lower the price and then not be around the following year. I know we have more to offer then just a great product. I pride myself in going the extra mile and making sure my customers are atisfied with my work. I look forward to meeting you some day to "Take Back Your Garage!"